Commander Frank Gross will report on his first three months in charge of the Wood Street police district and answer audience questions. Walgreens store manager Christine Hansen will ask for a vote on allowing liquor sales along the 1600 block of West Chicago Avenue. Real Naked Food will introduce its new grocery at 1909 W. Division St. Win a prize! Bring handbill and flier litter from the neighborhood. Persons who collect the most will get a reward. 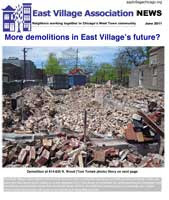 The newsletter also takes a look at building demolitions in the neighborhood and the mural set for dedication Friday at LaSalle II magnet school, 1148 N. Honore. EVA members can download the newsletter now from the OhSoWe discussion board.